Lots of Love Lobster Dinner. 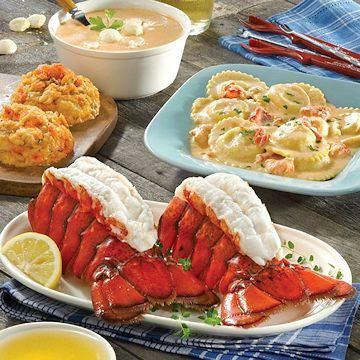 This complete Lobster banquet, fresh from the shore of Maine, contains all of your favorite lobster-laden comfort foods, hand selected for their quality and abundantly rich Lobster flavors. Meal serves 2 or 4. Fill a pot with just enough water to cover your lobsters, place lobster tails aside for the moment. Add other seasonings to the water if you like, these are not necessary for cooking, though. Bring the water to a boil and carefully drop in your tails. Once the water returns to a soft boil, reduce the heat. Set your cooking timer to the appropriate time (see below), and simmer uncovered for the specified time. Remove all tails from the water. Pick a tail to test for doneness. Using a knife, cut through the shell into the thickest part of the tail meat. The meat of a fully-cooked lobster tail is white with no sign of a translucent, grayish color. If you detect any translucency, or the roe (eggs) still appears black and shiny, put the tails back in the water for one-minute intervals until done. Err on the side of undercooking, you can always cook a bit longer to ensure perfect results. Boil tails for 4 minutes. Pan-fry in a non-stick pan over medium heat in vegetable oil or butter for approximately 5 minutes per side. First, thaw overnight by placing in your refrigerator. Once thawed, choose your cooking method. Microwave: Vent film. Microwave in the container on high for 2 minutes. Carefully remove film and stir. Heat for an additional 1-2 minutes as necessary. Oven: Preheat oven to 350°F (do not exceed). Remove film and heat in the container for 20 minutes. Serve as an entrée or an elegant appetizer. (222g) calories 310, calories from fat 210, total fat 24g, saturated fat 15g, trans fat 1g, cholesterol 115mg, sodium 680mg, total carbohydrate 13g, dietary fiber 1g, sugars 1g, protein 12g, vitamin a 20%, vitamin c 8%, calcium 10%, iron 4%. Ingredients: light cream, water, lobster meat, flour (wheat flour enriched, niacin, reduced iron, thiamine mononitrate, riboflavin, folic acid, malted, barley flour), butter (cream, salt), sherry (wine, salt), tomato paste (tomato paste, salt, citric acid), onions, celery, lobster base (cooked lobster meat, salt, organic evaporated cane juice, tomato paste, butter (pasteurized cream, salt), dried whey, natural flavoring, codfish, tomato powder), modified food starch, salt, paprika, spices, seasoning blend (salt, spices, dehydrated garlic, paprika, and dehydrated onion). Contains: milk, lobster, wheat, codfish. This product contains wine, which has naturally occurring sulfites. (6 oz. (170g)) calories 300, calories from fat 90, total fat 10g, saturated fat 8g, trans fat 0g, cholesterol 95mg, sodium 640mg, total carbohydrate 28g, dietary fiber 1g, sugars 1g, protein 22g, vitamin a 21%, vitamin c 31%, calcium 15%, iron 10%. Ingredients: Ravioli (pasta: enriched durum flour (niacin, ferrous sulfate, thiamin mononitrate, riboflavin, folic acid), water, pasteurized whole eggs. Pasta filling: lobster meat (lobster, water, salt), ricotta cheese (pasteurized whey milk & cream), heavy cream, mozzarella cheese (cultured pasteurized part skim milk, salt, enzymes), Panko crumbs (bleached wheat flour, dextrose, yeast, salt), egg whites (egg whites, water, guar gum), leeks, modified food starch, salt, butter flavor (maltodextrin, natural flavors, autolyzed yeast extract), ascorbic acid, black pepper). Lobster meat sauce: light cream, water, lobster meat parmesan cheese (pasteurized cows milk), flour (wheat flour, malted barley flour, niacin, thiamine mononitrate, riboflavin, folic acid), butter, sherry, lobster base (cooked lobster meat, salt, lobster concentrate, butter, tomato paste, maltodextrine, modified food starch, dextrose, corn starch, lobster powder, tomato powder, guar gum, clam powder, disodium inosinate, disodium guanylate and natural flavoring), tomato paste (tomatoes, salt, citric acid), celery, onions, modified food starch, spices & granulated garlic. Contains: Shellfish (lobster), eggs, milk and wheat.